Master Mold reveals to his hypnotized captive, Moira Mactaggert, that he is actually Stephen Lang – a human mind trapped within the Sentinel robot, after Cyclops destroyed his mortal body. 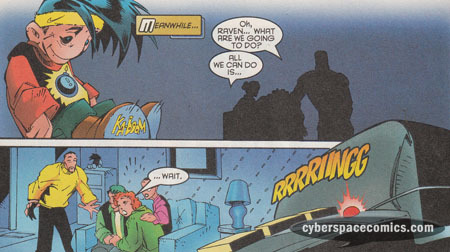 His companion computer, Conscience, discovers that Sean Cassidy has contracted the mutant-killing Retribution Virus that Master Mold made Moira create. Late in the night, Master Mold dispatches his Servitors to capture the virus-stricken Sean Cassidy (aka Banshee) and Mary Campbell (a young telekinetic). Their large numbers are too many for even Cyclops to stop them all! In this issue, we’re introduced to Sarah Slade, wife of Patrick Slade (the informant that lured Black Panther to South Africa on promises of news about his mother). The Black Panther ventures to the Slades’ artifact shop after thanking Zanti for his help and setting him loose from any obligation he might feel to continue helping. But, on his way home, Zanti discovers a militia man on the lookout and can’t keep himself from getting involved on the Panther’s behalf. And, while the Panther converses with Sarah Slade, the militia unleashes tear gas upon the area. Doctor Strange travels to Minerva, Ohio to rid Mary Windhart’s home of the demon infestation that she is somehow unaware of. And, after defeating her infested son, Bobby – the husband arrives home … and he’s not looking too healthy, either. After the super-heroes and villains destroy the city during their battles … who cleans up the mess? Why, Damage Control does! Rival super-clean-up broker, John Porter, is looking to horn in on their business, though. His latest stop is Josie’s Bar, where Daredevil and Turk are battling it out. After the bar gets leveled by a grenade, Damage Control steps in and replaces it near-instantly! Mrs. Hoag catches up with the ambitious Porter and offers him a job with Damage Control as Account Executive. Needless to say, his story is continued in the first Damage Control mini series (issue #1 also a cover date of May 1989). This is it! The first appearance of Damage Control. 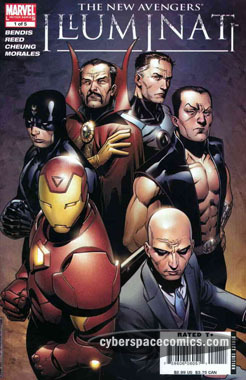 Now, it’s not a mainstay title but, they’ve had four mini series over the years so they do have some importance in the Marvel Universe. Topping off this issue is a cover by Rob Liefeld (who had not yet exploded due to the Image boom). 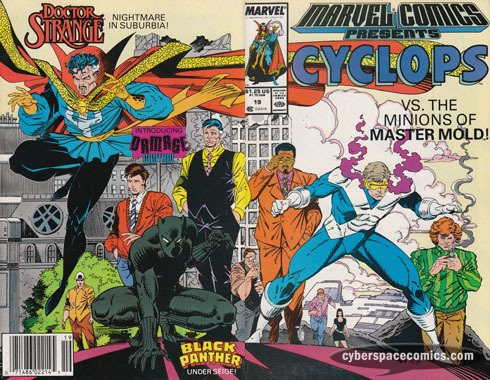 Steve Gerber was an important addition to the comics community. Not only did he create Howard the Duck (and many other characers including Omega the Unknown and Sludge) but he was an early champion for creator’s rights – they eventually revolutionized the industry. 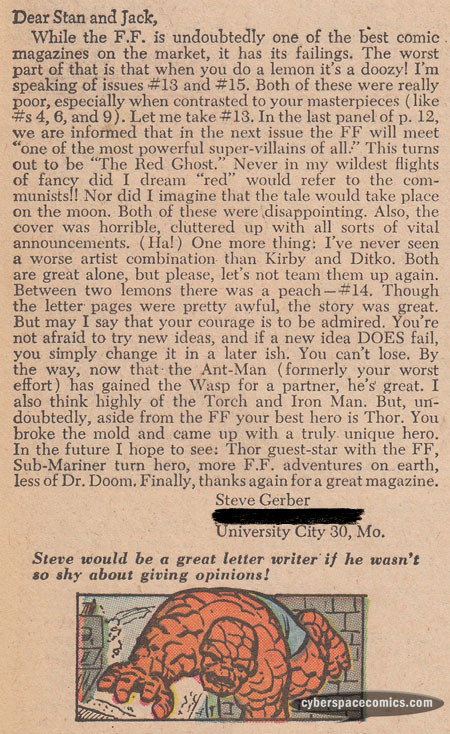 He got a letter published in Fantastic Four #19 (cover date – October 1963). 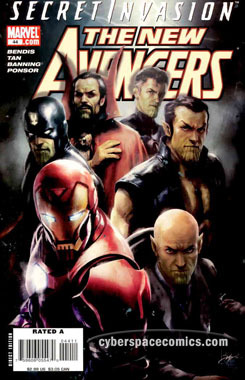 The Secret Invasion tie-ins were filled with classic cover swipes. This is probably the most recent swipe of the tie-ins. 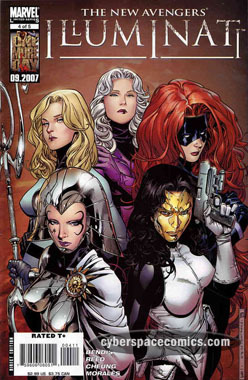 The original cover debuted a year prior. After the events of Marvel Mangaverse: New Dawn, the Godzilla-sized Hulk is on the loose in New York City. Adding to the monster’s destruction, Satanna and her minions are running loose. Curiously enough, while chaos is consuming the city, Damon Hellstrom calls a meeting with John Blaze, to reveal that they are brothers. He also empowers Blaze to become the Ghost Rider and they set out to fight Satanna and her demons. The super-sized evil mistress may be too big for them to take down … but, the Hulk’s enormous stature may just do the trick! Normally, I like fun and humor in my comics but, this seems to have just way too much of it. It relies on humor much more than action. And, with a book centered on these specific characters, the exceeding amount of humor just doesn’t seem to fit. Add to that the strange artwork, which mixes very cartoony character designs with burgeoning CGI technology (this was 2002, after all), and I just can’t give this book a high recommendation. * It should be noted that dissatisfaction with this book starts at the very cover. Even though Werewolf By Night is prominently featured on the cover, he doesn’t appear in this story at all. The next day, Cyclops and Banshee both have the same feeling that something is wrong on Muir Island. The Irish super-hero shares his concerns about Moira’s odd behavior. Moira MacTaggert interrupts their meeting with news that Mary Campbell has fallen ill. The young girl belongs to a family that rents their home from Moira. When the three of them go to investigate, Mary’s brother Bobbie claims that the “Little People … the people in the lights” caused his sister to come down with this deadly infection. Later that night, the “light” attacks Cyclops while Moira, in a daze again, meets with Master Mold! The alpha sentinel explains that both Mary & Bobbie were exposed to the virus but, because Bobbie is human, it didn’t affect him. South African Magistrate, Anton Pretorius, meets with Corporal Percy Boraine to discuss the Black Panther‘s presence in their country. He puts the country on alert that an intruder has infiltrated their nation and reinforcement troops are dispatched to the Panther’s last-known location. Meanwhile, in that same area, the Black Panther and Zanti Chikane have reached their goal: the Panther’s sonar glider. This tale begins as She-Hulk is struggling against that worst of foes: boredom! So, she phones Ben Grimm – otherwise known as the Thing from the Fantastic Four – and she explains how fun it’d be to take on Doctor Doom, Magneto and then Galactus. All in the same day! 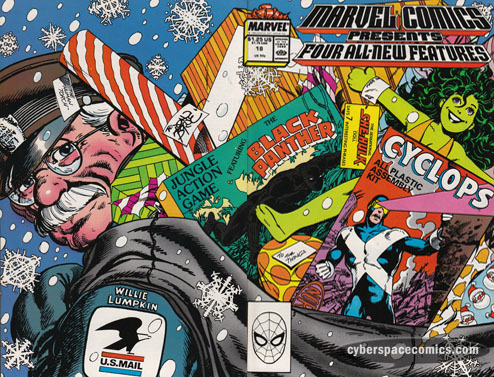 After her phone call, she reaches under her tree to open a present from Marvel Comics. It’s a box full of Sensational She-Hulk #1’s. We’ve been had – this was all just to promote her then-upcoming series (it debuted this same month). The events of Charles Dickens’ A Christmas Carol are about to befall J. Jonah Jameson but the Ghost Of Christmas Past accidentally loses the ol’ codger’s address! So, he mistakenly descends upon the Fantastic Four’s mailman, Willie Lumpkin. As the Spirit takes Willie through moments in his life, it becomes evident that he’s one of the nicest guys out there. The Spirit has made a huge mistake … but will he realize it before he shows Willie how he dies? In this issue, the continuing sagas build some more steam but the one and done tales fall flat. Kevin Dooley is a former editor for DC Comics who also wrote a few issues of Mister Miracle, Green Arrow and other titles. He got a letter published in Green Lantern#188 (cover date – May 1985). Sean Young is probably best known for her role as Rachel in Blade Runner. She was originally cast as Vicki Vale in Tim Burton’s Batman but, an injury caused her to drop out – she was replaced by Kim Basinger. Intent on being in a Batman film, Young later appeared on the Joan Rivers Show wearing a Catwoman outfit, in an attempt to be cast as the character in Tim Burton’s Batman Returns. Supposedly, she even showed up at the Warner Brother offices in the costume, trying to land the role. In Peter David’s excellent run on X-Factor, Strong Guy claimed that he had spent some time with Young. And, in issue #79, she showed up for a date … in the Catwoman outfit. 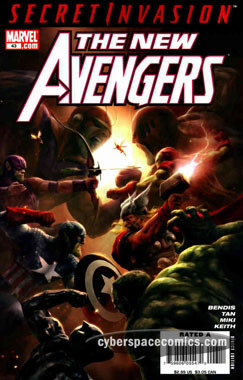 The Secret Invasion tie-ins were filled with classic cover swipes. 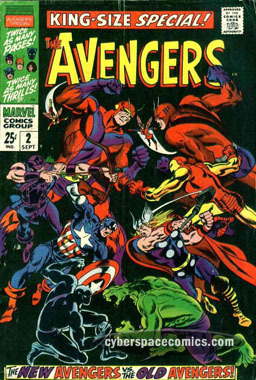 This one pays homage to the Avengers’ second annual that pitted the new team versus the old team and debuted the Scarlet Centurion. When the DC and Marvel Universes merged in Marvel vs DC, a new one was created: the Amalgam Universe. This one-shot combined X-Force with Doom Patrol and Teen Titans. Brother Brood and his Brood have captured Niles Cable. Now, it’s up to his team, X-Patrol, to free him. This time, the team (consisting of Elasti-Girl, Shatterstarfire, Beastling, Dial H.U.S.K. and Ferro Man) have a new recruit named Jericho (a gray version of the Fantastic Four’s Thing with a glowing eye). And, although Elasti-Girl recommends him – the rest of the team is unsure of his trustworthiness. Meanwhile, back in Zenosha, the captive Niles Cable has been infected with a Brood implant that will eventually overtake his body and consciousness. He has the power to destroy the implant but, doing so will release his control over the techno-virus that infects his body. Killing the implant would mean finally succumbing to the infection that he’s faced for decades! 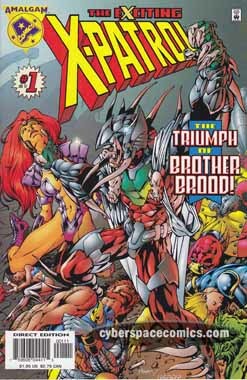 When the team finally reaches Zenosha, they face off against the Brood, Terra-X the Destroyer (a neat combo of Terra and Galactus’ herald, Terrax), and the Brood. While they’re distracted, the brood implant has nearly overtaken Niles Cable and he is forced to fight his own team. However, Jericho sheds his rocky outer shell and reveals who he truly is: [a young, techno-virus-free Niles Dayspring – which explains that glowing eye], come to save the future from Brood infestation. This powerful mutant destroys Brother Brood and frees Cable of his brood implant. Plenty of fun action to be had here and powerful art by Bryan Hitch. Same as last time, the Beastling provided some much-needed humor and fun but, unfortunately, Elasti-Girl was much more serious this time around. The story really seems to draw strongly on the Cable mythos, so fans of his will probably have a stronger appreciation for this issue. And, who doesn’t enjoy a good mystery hero?